As a kid, I spent the majority of my spare time outdoors, playing sports. The main sports in those days at school were football, baseball and track. If it rained, you went into the gym and played basketball. If the coach was in a good mood, we got to play dodgeball! When we weren’t at school playing organized team sports, we were in the backyard or a vacant lot, playing football and baseball, or dodgeball, with our neighborhood buddies. There was no Pop Warner baseball, no youth football leagues, and the sport of soccer was virtually unknown. Tennis and golf was something you could only do if your family belonged to a country club! We didn’t have cell phones, laptops and iPads. There was no Xbox or Play Station. There was no cable TV with 800 channels; there were only three channels on TV, maybe four, if you had a public TV station in your town. Times have changed. Today’s kids are growing up surrounded and influenced by technology. They have mastered the use of electronic devices before they know how to ride a bike without training wheels! As parents today, we face many obstacles in raising our kids to become productive and successful adults. There are ever growing challenges set upon our kids to be accepted to institutions of higher education, aka college. Because of this, our local school systems must now meet state, national and international standards that require more time to be committed to academics and less time to physical education. Kids in school today just don’t spend as much time in what we called gym class (nowadays referred to as physical education or P.E.). Middle schools and high schools still do a great job of offering organized team sports for the kids, but learning the fundamentals of all sports needs to be to be taught and learned when kids are at an elementary school age. In today’s world, these activities are, for the most part, outsourced to off campus activities. The soccer, softball, flag football leagues, etc. are a great experience and opportunity for kids to learn the fundamentals of these sports. Also in today’s world, as parents and as families, we face a different challenge then our parents did. Gone are the days when dad worked 9to 5and mom stayed at home. Most families I know are two income households. Both mom and dad have full time jobs. Kids in elementary school these days have more homework than I did in high school! Nadal warming up with a soccer ball on the tennis court. enough hours in the day. As a parent and a coach, I feel it is important for kids to stay active and participate in sports. I believe a healthy body leads to a healthy mind! As a parent, I am a big believer in old-fashioned family time at the dinner table, discussing our day’s activities. NO TV, NO cellphones, NO iPads – just talking and communicating with each other. Unfortunately, with everybody’s busy schedules, this is not an easy task for today’s families to accomplish. As a coach, I truly feel it is important for kids to try all sports. I too often see kids give up on sports entirely, because they get burned out from over participating in just one sport. I grew up playing all sports and ended up choosing tennis and making tennis my career. 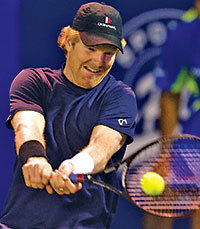 Tennis commentator and former world number one player Jim Courier grew up here in Florida playing baseball and discovered that tennis was an easy transition from his baseball skills as a young child. Rafael Nadal is an avid soccer player. 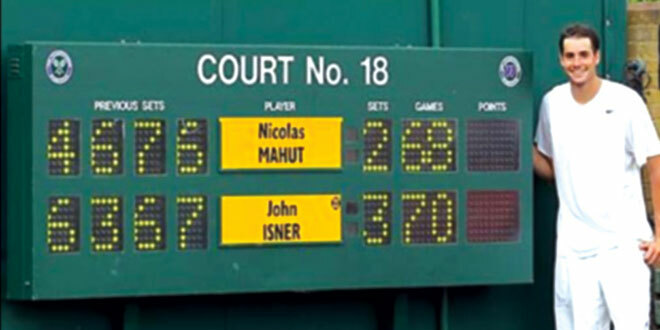 Current tour professional John Isner at 6’10”, as a high schooler, had to make a decision whether to go on to college as a basketball player or to devote his talents to the sport of professional tennis. Isner has maintained a top ten world ranking over the last few years and has been quoted stating that he has never looked back or had second thoughts about his decision to choose tennis as his sport. Tennis has been called “the sport of a lifetime,” and I encourage kids to learn how to play tennis to eventually be able to incorporate it as a lifetime social activity. However, times are changing. The sport of pickleball is now more popular than ever and I have an unprecedented number of adults wanting to learn to play this fun, competitive sport. Many of these adults are lifetime tennis players. Because of this flood of interest in pickleball, I decided that I needed to learn the proper fundamentals and strategies of the game, so I could pass it on to my customers. Three years ago, I sought out top-level instructors, who were in Naples competing in what is now known as the Pickleball U.S. Open Tournament, and I asked if they would pass their knowledge of the game on to me, so I could grow the sport at my facility. They were more than happy to accommodate. Courier showing his baseball skills when striking a two handed backhand in tennis. advanced level player. All of the sports I played as a youth made the learning curve for pickleball much easier to conquer. It made me feel like a kid again! Thanks to their generosity and their love for the sport of pickleball, it was one of the most educational and inspirational experiences of my life. The fundamentals involved in all sports translate to one another. The more sports kids are exposed to at a young age, the easier it will be for them to choose and focus on one individual sport when they get to middle school and high school. Living here on Marco, our kids have the luxury of being able to participate in wide variety of organized outdoor activities. Most activities for kids like football, softball, soccer, etc. have a season. I offer my youth tennis programming at The Racquet Center on year round basis. I encourage kids who are participating in my tennis programming to try other sports. I quite often see that when they do, and they return to tennis, their game improves because of the fundamentals they’ve learned participating in those other sports. Wayne Clark is a certified professional tennis instructor with over 25 years experience coaching players on all levels of the game. Wayne is also qualified in pickleball instruction. He has been the head instructor at the Marco Island Racquet Center since 2001. The Racquet Center offers clinics, private and group lessons for both tennis and pickleball. Coach Wayne’s Island Kids Tennis juniors program runs year round, and has classes for players from kindergarten through high school. The Racquet Center has open rotational pickleball play for all levels, as well as tennis round robins on a daily basis. Please contact the Racquet Center at 239-394-5454, if you are interested in participating. Wayne Clark is a certified professional tennis instructor with over 23 years experience coaching players on all levels of the game. Wayne is also qualified in pickleball instruction. He has been the head instructor at the Marco Island Racquet Center since 2001. The Racquet Center offers clinics, private and group lessons for both tennis and pickleball. Coach Wayne’s Island Kids Tennis juniors program runs year round and has classes for players from kindergarten through high school. Contact Coach Wayne by email at WClark@cityofmarcoisland.com, by phone or text at 239-450-6161, or visit his website at www.marco-island-tennis.com.